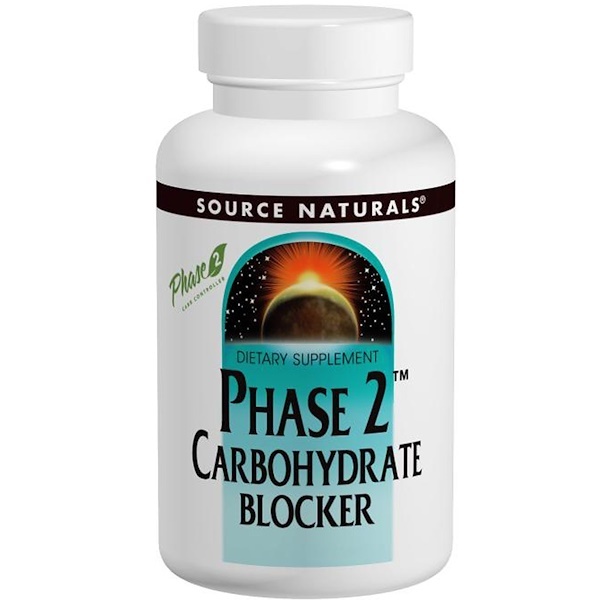 Source Naturals Carbohydrate Blocker contains Phase 2 white kidney bean extract. Phase 2 works by slowing down the digestion of starch by inhibiting alpha-amylase, an enzyme that breaks down starch to be more fully absorbed by the body. Carbohydrate Blocker may help support weight loss when used in conjunction with the Maximum Metabolism Weight Loss Plan (included). 2 tablets with a glass of water (8 ounces), 5 to 10 minutes before a meal containing starch. If Carbohydrate Blocker is taken too early, it can pass through the body before interacting with food. Do not exceed 6 tablets per day. Microcrystalline cellulose, stearic acid, and modified cellulose gum. Caution: May cause more frequent bowel movements, and stomach upset. If you have diabetes, consult your physician before using this product. Do not use if you are pregnant, may become pregnant, or breastfeeding.